Our Constitution and the Bill of Rights is such an important part of American History! 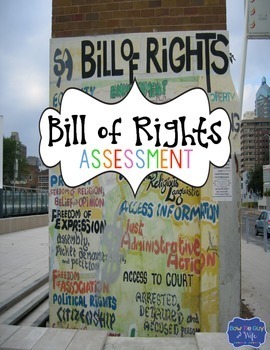 This assessment includes 21 multiple choice, 10 matching vocabulary, a "Which Amendment Was It?" 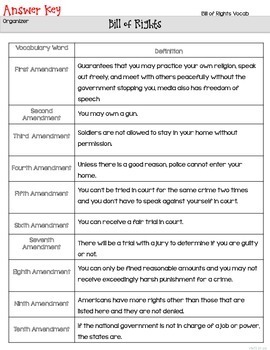 matching quiz, and a constructed response writing prompt covering the first ten amendments of the United States Constitution. ★You cannot be tried two times for the same crime. ★You can only be fined reasonable amounts and you may not receive exceedingly harsh punishment for a crime. 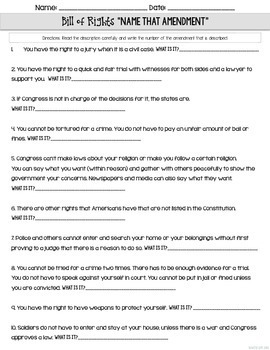 ★Americans have more rights other than those that are listed here and they are not denied. ★If the national government is not in charge of a job or power, the states and people are. By popular request, I have added a constructed response portion at the end of the test for practice for the upcoming Georgia Milestone test but it could be used for any state. An answer key and rubric are also included for easy graded. 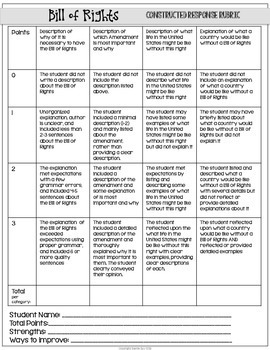 There is also a vocabulary organizer included for use prior to the assessments as a study guide. →Check out our website for teaching tips, ideas, & freebies!